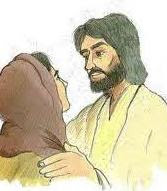 Jesus was gentle with Martha. We all nodded when Jesus told her "your brother will rise again". We believed in resurrection at the end of time when God would make everything new, like Isaiah prophesied. It's good to speak of that hope, but it doesn't make grief easier when someone you love has died. But Martha had great faith and through her tears she said she believed that.